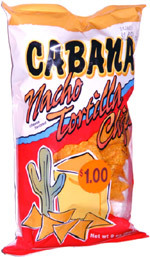 They taste pretty much the same as Nacho Cheesier Doritos, and they're a pretty blatant ripoff of them, from the recipe to the look of the bag. However, the problem is that the flavor powder doesn't stick the the chips nearly as well as it does with Doritos. It gets all over your hands and all over the place. Smell test: A decent cheese smell, with a bit of a kick to it.